“Sprint: How to Solve Big Problems and Test New Ideas in just Five Days” is a book about innovation. Sprint is a one-week-long innovation process that contains five 7 to 8 hours working days and a quite strict script to follow. 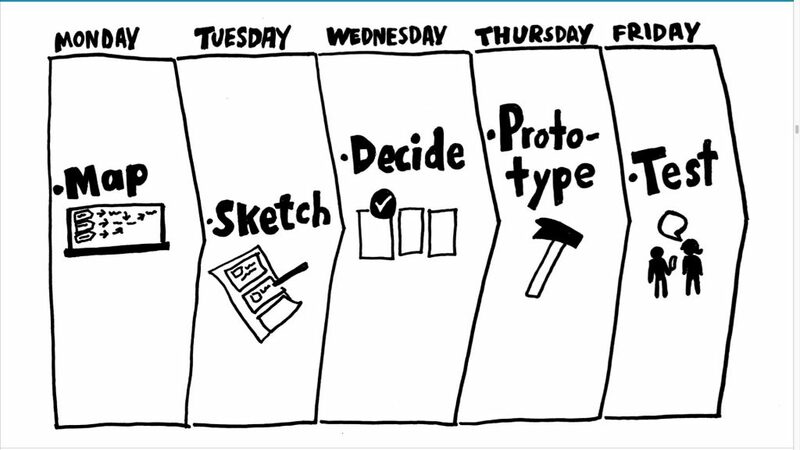 Sprint week starts from mapping out the problem and ends in prototyping and feedback from the product or service. At first, I was little bit skeptic when I started to read this book. Overall there are way too many books that foists one solution to all problems. But the more I got into this book the more I thought it offered something new and fresh. One of the book writers Jake Knapp worked in GV (Google Ventures) for over 5 years as a Design Partner and before that over 5 years as a Designer in Google. GV is described in their own website as follows “… GV is the venture capital arm of Alphabet, Inc. We’ve invested in more than 300 companies that push the edge of what’s possible. In the fields of life science, healthcare, artificial intelligence, robotics, transportation, cyber security, and agriculture, our companies aim to improve lives and change industries.” During his time in Google Jake Knapp developed “design sprint” – method which he tested and developed further in GV´s portfolio companies with his co-writers and Design Partners Braden Kowitz and John Zeratsky. Later on this design sprint is mentioned as a sprint in this article. During my career, I have bumped into number of different kind of innovation methods. Most of them are good even great but none has yet to offer such an overall solution and guide from start to finish as Sprint book method offers. As earlier mentioned sprint is a five-day period to map out and identify the problem or problems, innovate, generate and sketch ideas, decide the best idea to prototype, implement a prototype and test it with your customers. From picture above you can find main team for each day of the week. In this one-week long sprint focus should be 100% to the task in hand. That means nothing else in schedule and all mobile devices are banned for most of the time. Team, time, objective, question and what to do? Sprint team should be versatile and heterogenic. Two most important roles in the team are decider and facilitator. In sprint, there should always be a decider in the room or at least a person who has authority to make the decision concerning the problem in hand. It goes without saying that it increases the change to success when you have a true power in sprint. Other really important role is also the facilitator of sprint. Best solution is that the facilitator is someone with experience from sprints but we all start from somewhere. Facilitator is the person responsible to run the sprint in time and smoothly as possible. Idea of the sprint is presented above. More information you can find from the website www.thesprintbook.com or straight from the book. As I mentioned earlier at first, I was little bit skeptical towards this book. But after reading I really think that this is a great solution for many organizations. Problem can be big or small sprint offers a solution for that. There are few things why sprint works. One and the most important thing is that deadline is near. It is one week and we need to have prototyped and tested solution for our problem. Another thing is that the whole week is dedicated to sprint. No mobile devices, emails or other things that mess up our focus and take our attention. All energy is focused directly towards the problem in hand. Last but definitely not the least sprint creates prototype and it even tests the prototype with real customers. This one might bedazzle you but believe me after reading the book you understand. The idea is that prototype needs only to work for a short period of time. On the other hand, the prototype can also be presented as an idea. At the end, we get essential information and feedback from our customers. Sprint is the type of process that works as well in Fortune 500 company as a one-man start-up. It is also useful in public sector organization. I would highly recommend it to be tested in higher education environment also for example when developing new curricula. It is also a safe environment to test it during some project for example and it is a good tool for student to implement it in their workplace after graduation. “Sprint: How to Solve Big Problems and Test New Ideas in just Five Days” book surprised me. It really was a good book and gave lot of clicks. It is a tool that I’ll be implementing in future and maybe after this article so will you!